Registration increases value of the registered Pit Bull and its offspring and contributes to the overall improvement of the breed image as a whole. As value improves people take greater pride in their ownership and subsequent neglect, abuse, and shelter turn-ins decrease. FREE frameable printed visually enhanced pedigrees of up to 7 generations. FREE Kennel Certification for those APBR breeding members who agree to our Kennel Certification Code of Ethics. APBR Kennels who sign up with this program are eligible to have their Kennel listed on our sites in the Certified Kennel section as well as in the randomized footer at www.PitBullSocial.com. Banner placement is a valuable promotional tool as we serve MILLIONS of hits every year and maintain the Internet's largest and most comprehensive sites on the Pit Bull and are the Web's foremost authority on the breed. Family Discounts on sire, dam and litter combo registrations. The average registration processing time for an Individual Pit Bull is approximately 6 weeks to complete. Litters and Family Discount signups are given the highest priority due to the often time sensitive nature in which the breeder needs the Pit Bull puppy's material for the new owners. These are typically processed in 2-4 weeks. Access to the American Pit Bull Registry's ( APBR ) proprietary Family Profile genealogical and cross registry tracking services, which are the most advanced such services in the Registration industry. This gives our members unmatched knowledge of Family relationships and histories with FREE and regular ongoing updates. Pedigrees with unlimited depth and up to 12 generations in a single snap shot with visual enhancements. Access to visual depictions of your Pit's Family giving you a unique understanding of the genetic makeup of your Pit and other Family members. FREE access to unlimited genealogical tracking within each registered Pit Bull's Individual Profile. Ability to easily share Individual Pit Bull Profiles with other APBR members and the Pit Bull community when considering breeding. This helps to better cater litter outcomes based on the demand in the Pit Bull community and desires of specific customers and numerous other characteristics desired in a breeding program. A genetics primer to help you understand how basic genetics work and how you can use and manipulate genetic properties to better meet the exact needs of an organic Pit Bull community. Learning to cater development to demand is one of the single best ways to maximize the bottom line in a breeding. These are also the same Pits that are most likely to maintain loving forever homes. FREE blogs, picture and video sharing and forums providing members with information and opportunities to interact on current topics of health, Breed Specific Legislation, training, event announcements, re-homes, Kennel development and much much more. Unlimited priority support in assisting you with any issue you may have in regards to your American Pit Bull Terrier ( APBT ) / American Staffordshire Terrier ( AST ). Because the APBR receives over Millions of hits each year, administratively it is impossible to maintain any real ongoing level of live correspondence with everyone who wishes it. Our members however have access to using special account services that place their correspondence as a priority. Special access to member only discounts. Free placement of pictures available for general viewing through our Member Gallery. 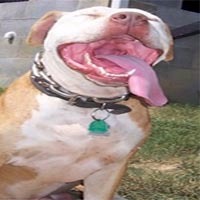 Free use of our Member Exclusive APBR Pit Bull Classifieds. FREE membership and level boost to Pit Bull Social a social network of Pit Bull owners and enthusiasts dedicated to positive promotion of the Pit Bull breed. 7 Unique APBR registry exclusive on demand visually enhanced printable relative reports. Access to the world's largest printed pedigrees (Super Pedigrees) of any registry ranging from 8-11 generations for qualified Pit Bulls. Eligibility for financial assistance if you are the victim of Breed Specific Legislation ( BSL ). And much, much more! We are committed to constant improvement and growth. 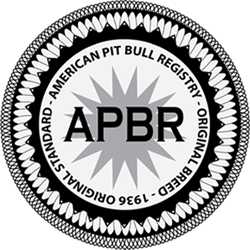 The APBR is a Member Active Registry, which allows our members to have direct input and impact in helping shape programs matched to the needs of the Pit Bull community and their individual needs as owners. "REAL BENEFITS" that provide programs and services unparalleled. Investing in membership with the American Pit Bull Registry provides more than just 'papers' - we provide our members with opportunities unmatched, value, pride and a benefits and service package unmatched in the registration industry. Our 11 Gen Super Ped is over 805% larger than anyone elses in the industry. Includes FREE shipping, protective tube, seal and jewelers magnifying loop. 4-7 Gen fee varies based on mailing and other options. $12 per yr. - $30 for 3 yrs. Ranges from $2.25 Per Click to $1,200 per month. With our proprietary service we offer the most advanced tracking in the industry. Service comparison chart 2-16-12. Other registries are subject to change without notice.